I’ve been using mousses for two years now and the most common worry that people have is fitting them. I must admit that without following a few basic guidelines it can be a bit of an issue getting it right. 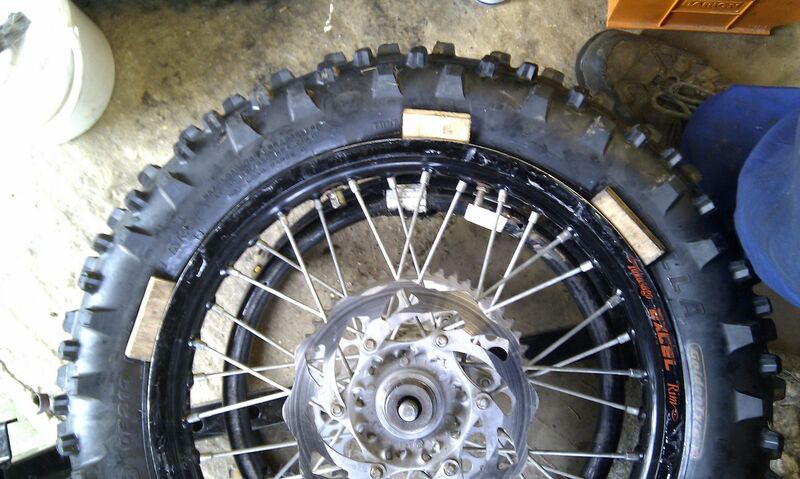 Mind you getting the old tyre off (with mousse in) is even worse! 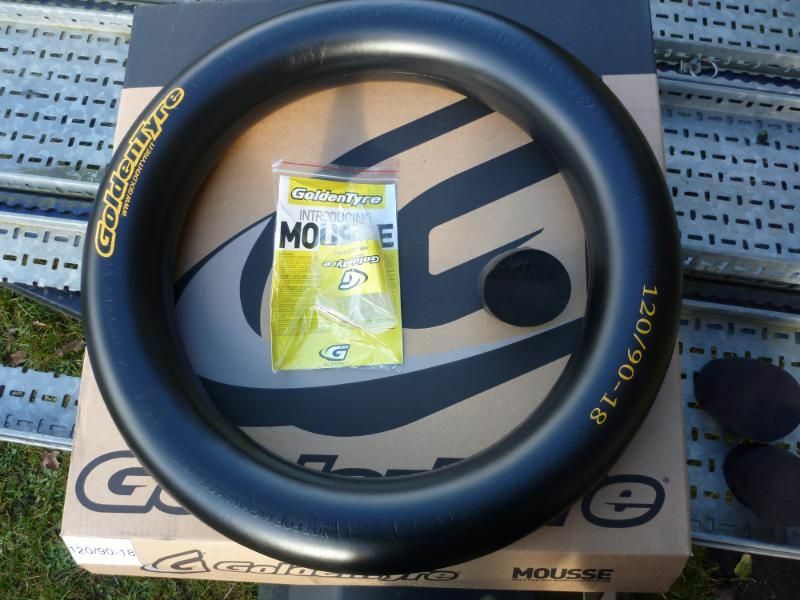 However - having learnt from my mistakes (sorry Phil & Tony), I fitted a new tyre and mousse at the weekend and it was so much easier when you know what you are doing – more or less. 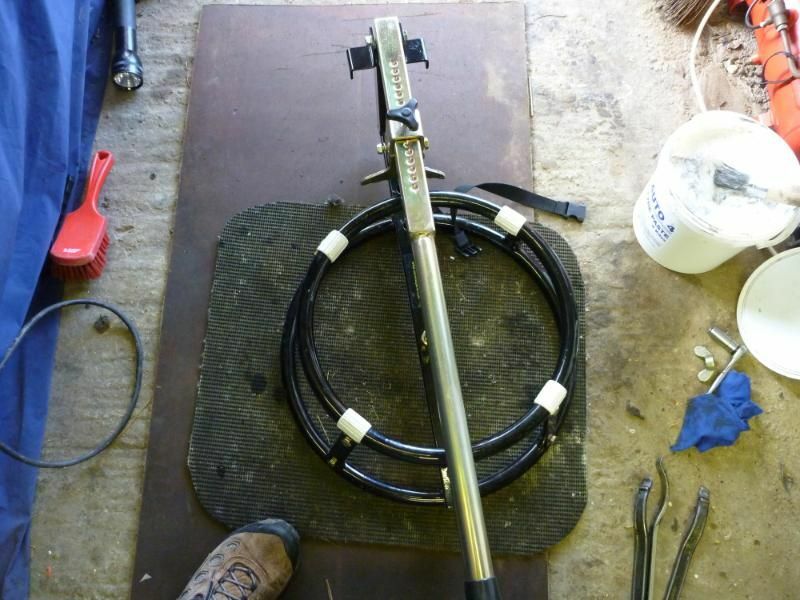 ok since i wrote this i has been pointed out that the bead breaker has some tyre lever holders build into it! doh! Now there are bound to be guys that don’t use a bead breakers and I was one of them, but they can be had for £50 off ebay now (I checked again today –from Germany) so it makes sense to get one. 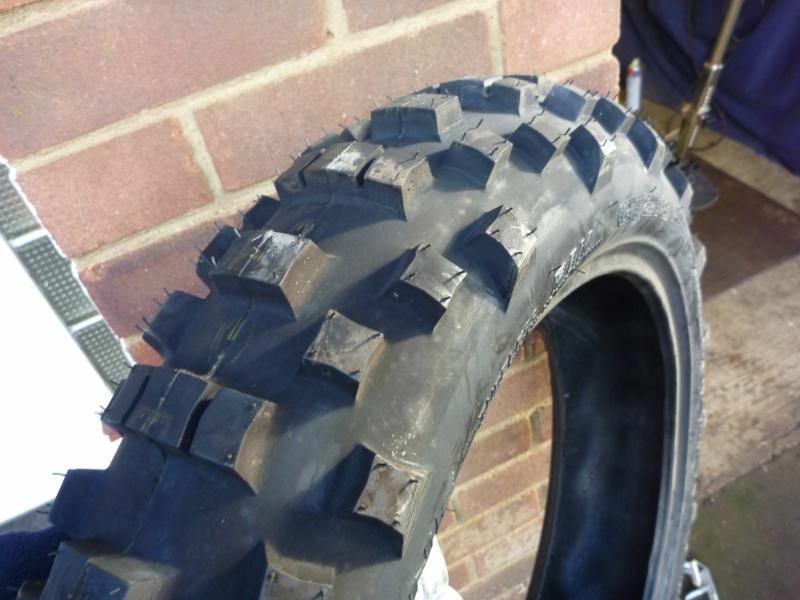 They do make it so much easier when trying to remove the tyre (once it has a mousse fitted) so it’s well worth the money, and they last a lifetime. 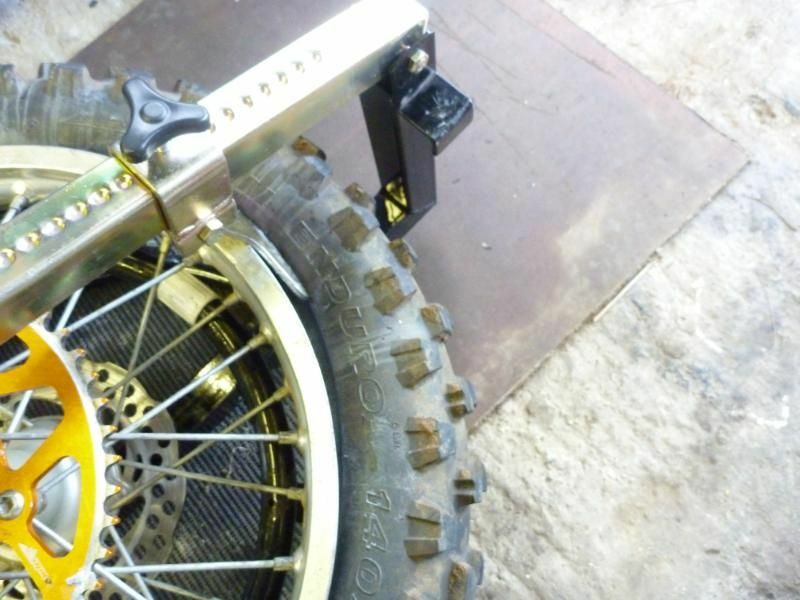 Bread Breaker - optional but well worth it. Before you start - So first of all I placed the new tyre in-doors next to the warm radiator, as it was only a few degrees outside and having the heat soften the tyre would make a world of difference later. 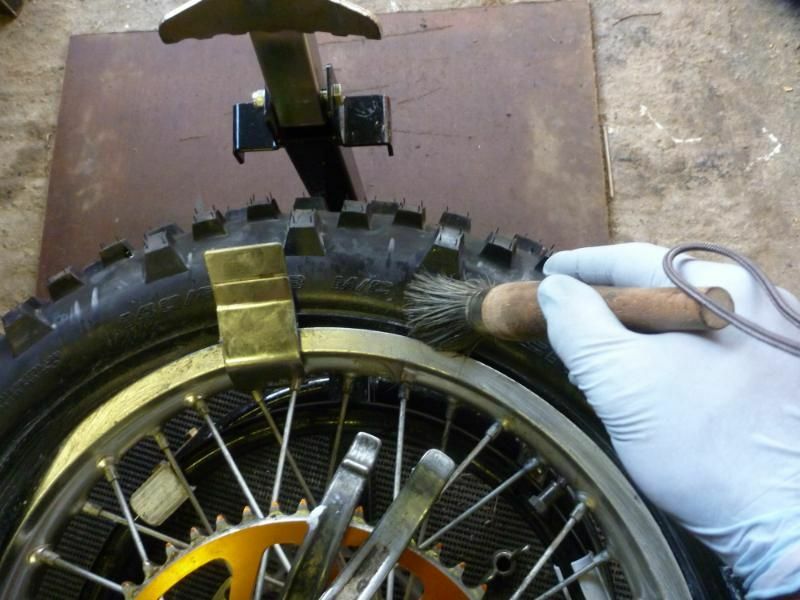 At the same time I brush on some tyre paste, to help the tyre slip off a bit easier when you start to lever it off. 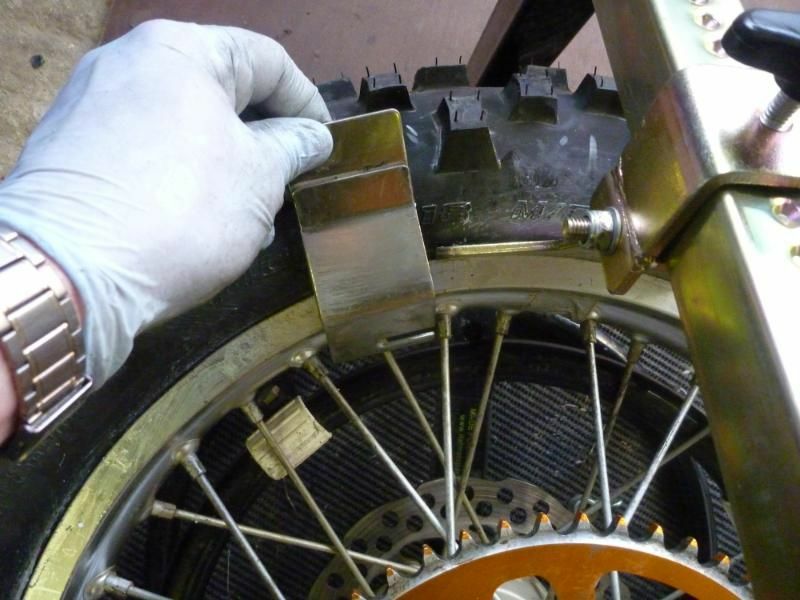 Once both sides have been ‘broken’ and pasted, you can use the bead breaker to push the tyre down into the rim so that you can get a tyre lever under the tyre bead. 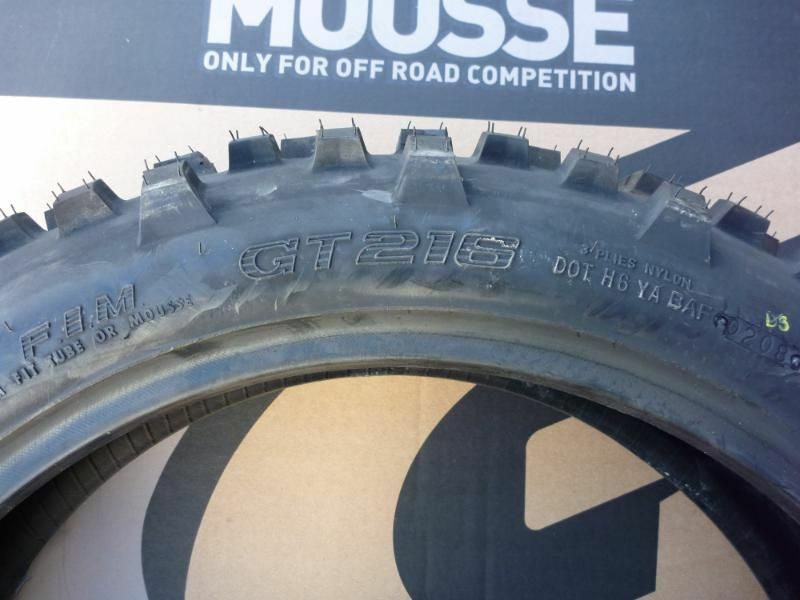 As this mousse was two years old and the tyre was soft there was no need to clamp the tyre to create some slack (see later). 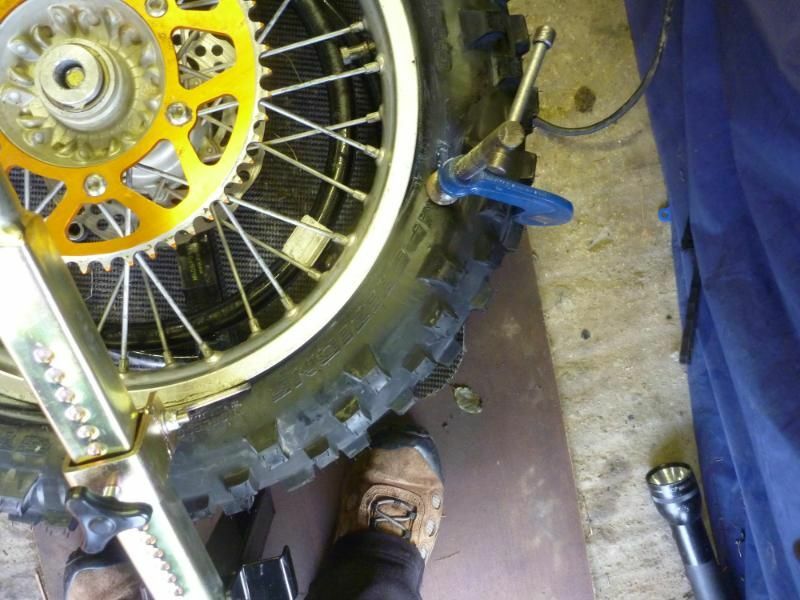 Having got two tyre levers in place you can now see I’ve levered the tyre off the rim. Once you’ve got it this far it’s just a question of following it around until it's all off. 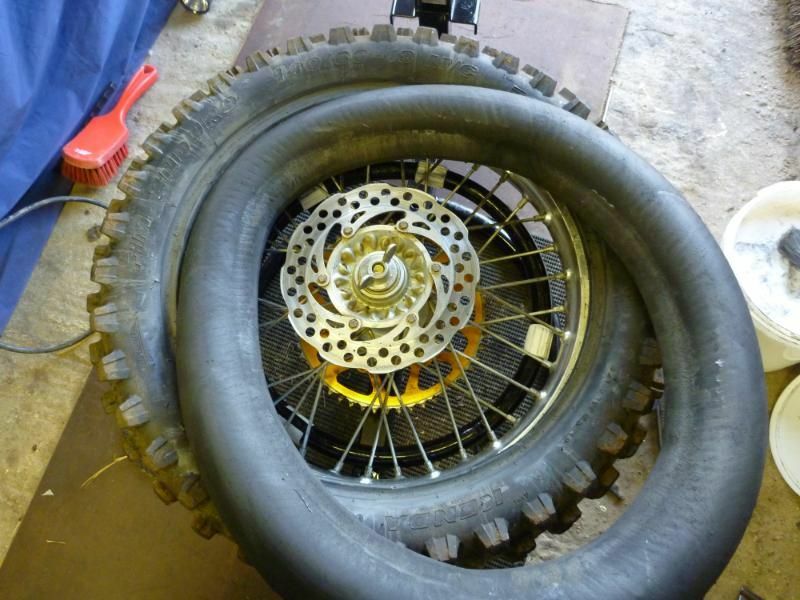 now flip the tyre over and use the breaker to push the tyre down so that it drops down into the centre of the rim. The old mousse is now fully out. 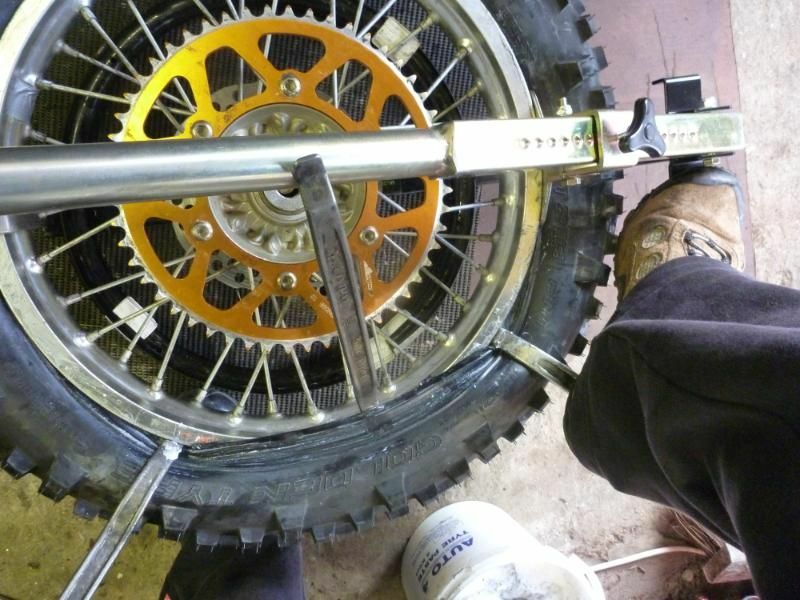 Use the levers once again to get the second bead off the rim. A bit of foot action gets the rest off. Job done?……no….now the cleaning starts! 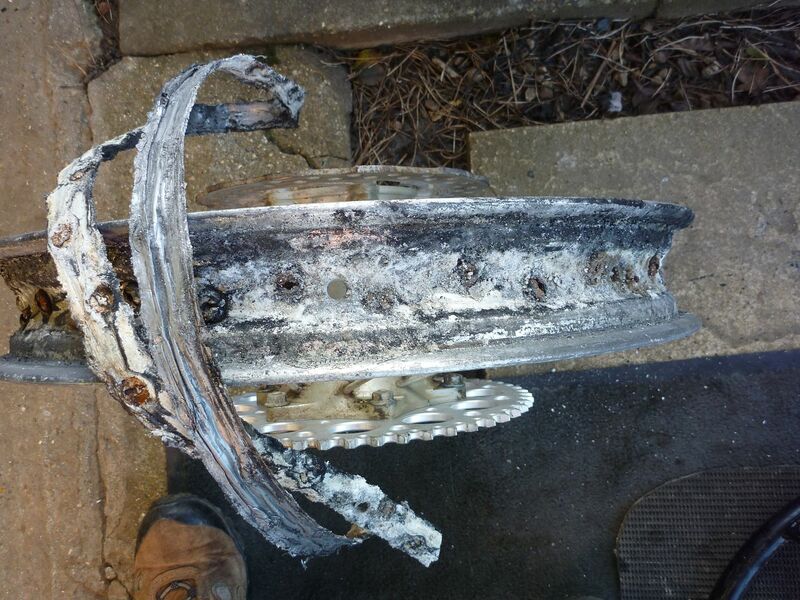 Check out the debris inside the old tyre! General dirt and crap mixes with the mousse lube and worn off mousse, to make a grinding paste. A bit of a brush up and some water soon gets it clean again. The old gaffer tape on the rim. Doesn’t look too bad and could be used again – right? Wrong! Take it off and check out the crap/rust below – yuck! 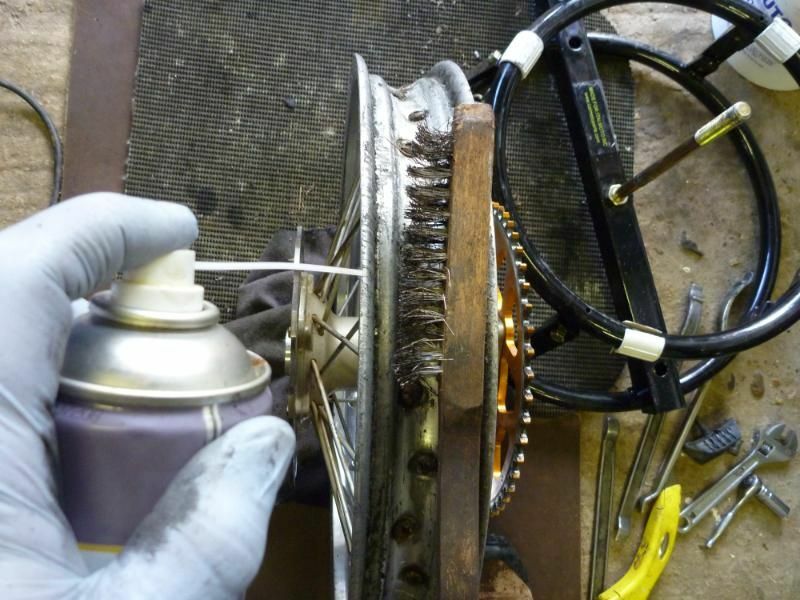 A good spray of your favourite release oil and a wire brush soon has most of the nasty stuff cleaned off. This was done the last time I fitted the tyre and has since only been used a few times, so it’s not like it been in there years. 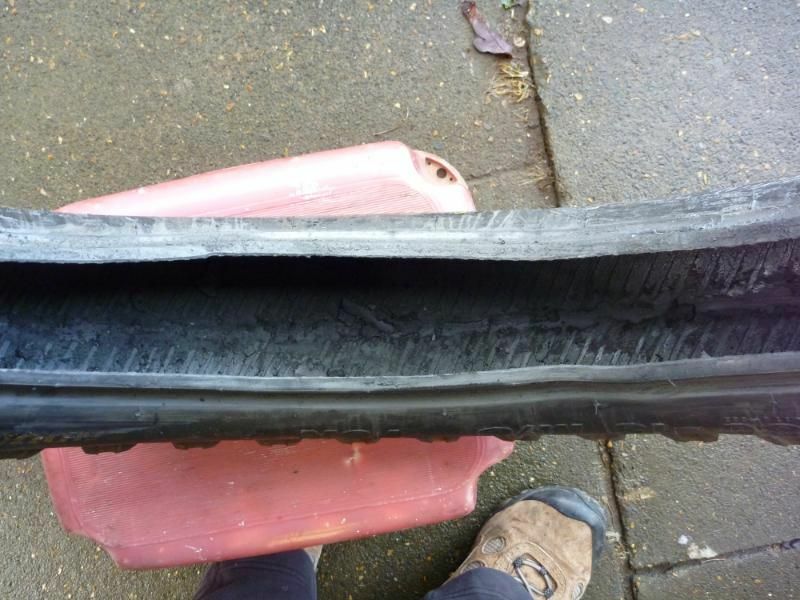 This is why you should do your own tyres. 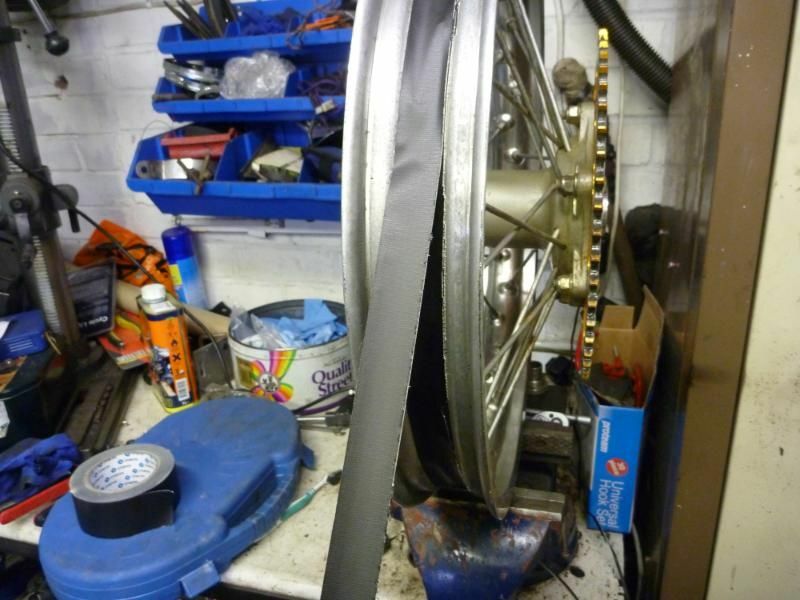 Can you imagine the local bike shop tyre monkey or ‘kwick fit’ guys cleaning up the rim? Next up is coating the rim with tape again. Even with the proper rubber ‘rim tape’ I always use some gaffer tape as well. I put a couple of layers on. Note that I cut it in half so that the overhang doesn’t interfere with the tyre. 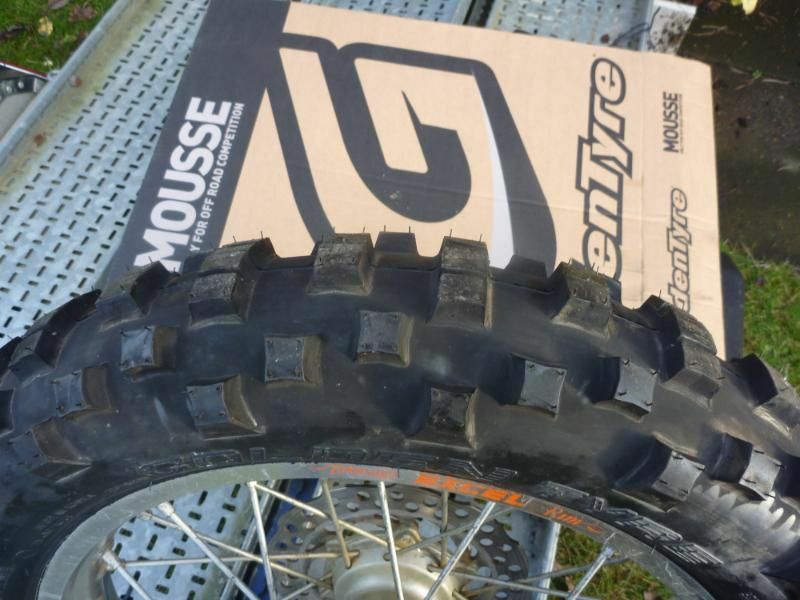 Next up was the new mousse and tyre. This time I’m using Golden Tyres products. They are doing some good deals on mousses at the moment and I must say the mousses do feel like a quality bit of kit. Not as hard as the Pirelli I used last time and very uniformly made. 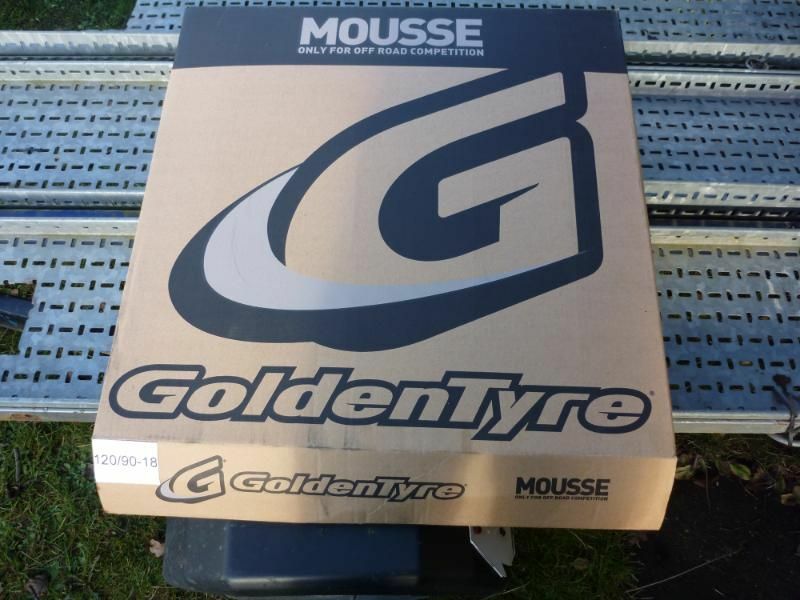 The tyre of choice today is the Golden Tyre GT216 which is for soft going. FIM approved. 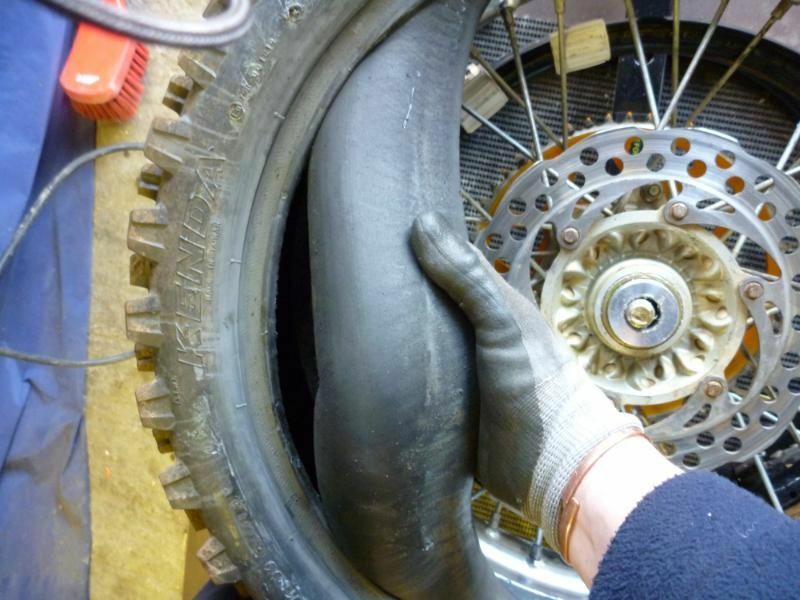 First of all you need to cover the whole of the inside of the tyre with lube. I leave a bit over to cover the mousse as well. 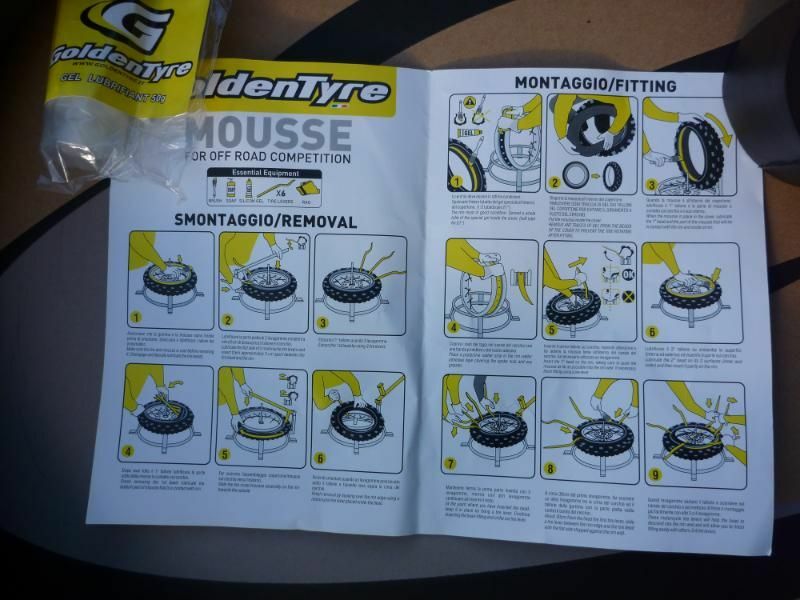 Once the tyres and mousse is fully covered (use all the lube) push it inside the tyre. Sorry no photos as it’s a messy job! 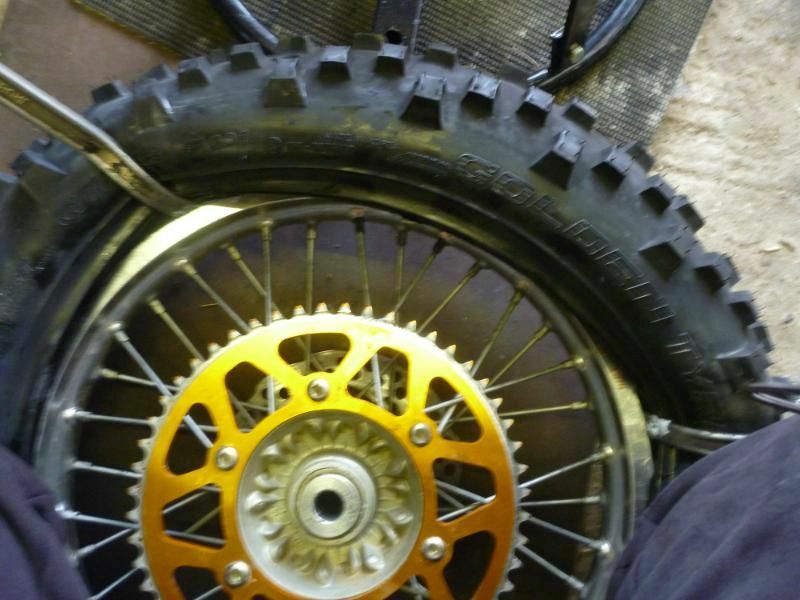 Next up is to give the tyre bead a light covering of tyre paste to help the tyre slip on. Now I tend to leave the rim lock in place (after cleaning) when I fit mousses. 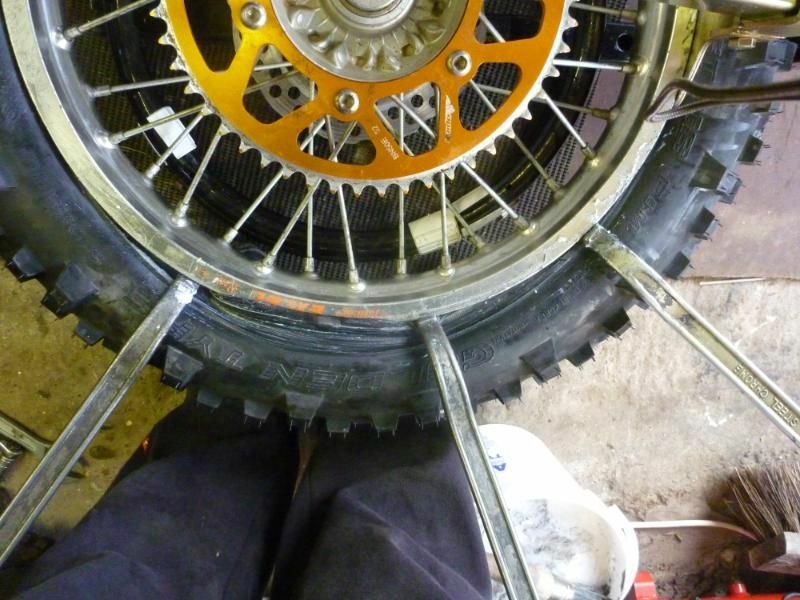 It’s not hard to get the tyre on with them in place but I find it a bugger to get them in afterwards. 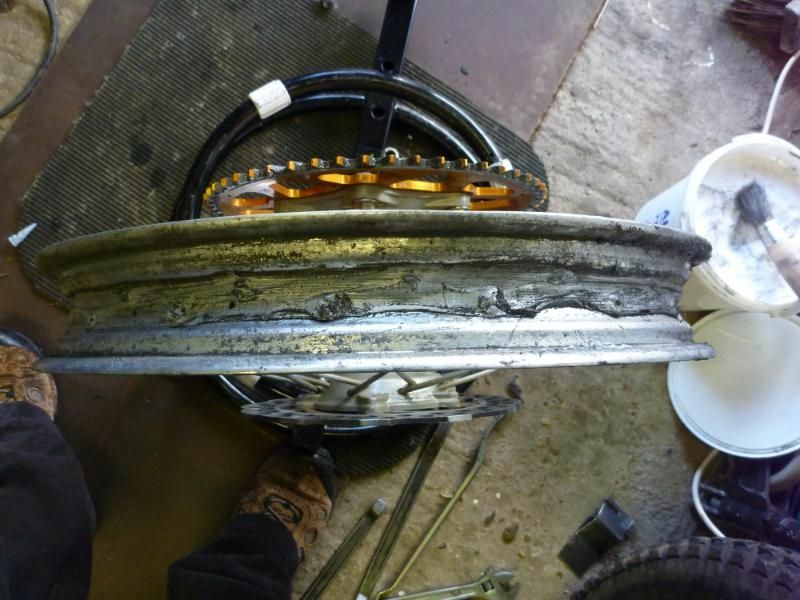 Don’t listen to the ‘don’t fit a rim lock’ lot. 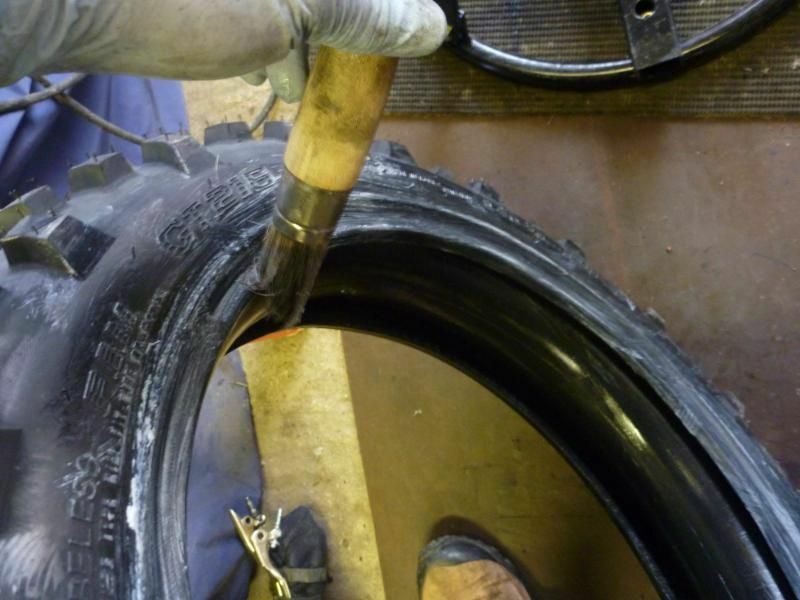 The tyre does move on the rim, so be warned and fit a rim lock. 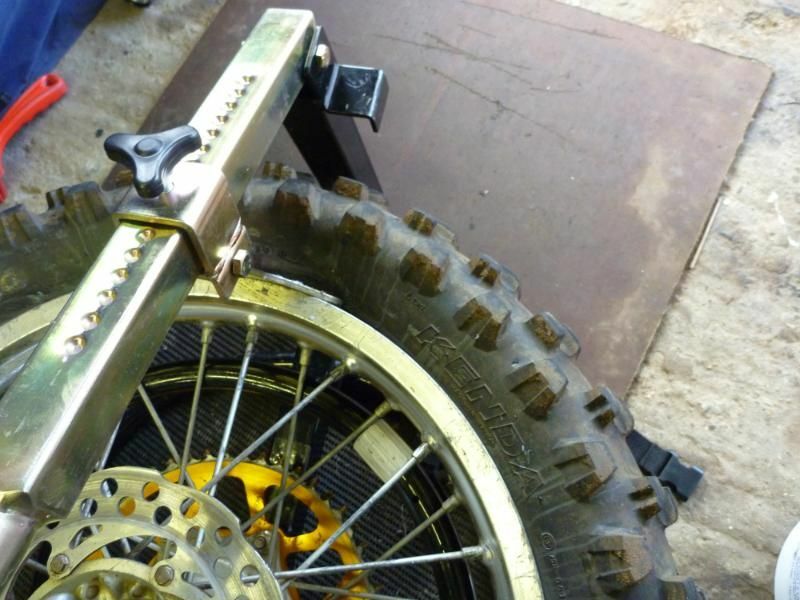 Push the tyre into the rim behind the rim lock and while holding it in place with your knees, using two tyre levers start to lever the bead over the rim. 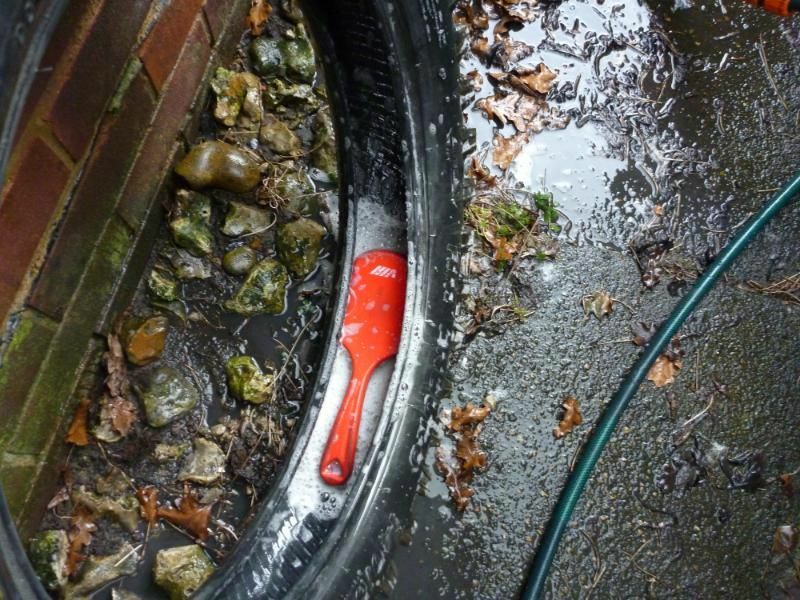 This can be a bit tricky sometimes and having the pre-warmed tyre is a bonus now. 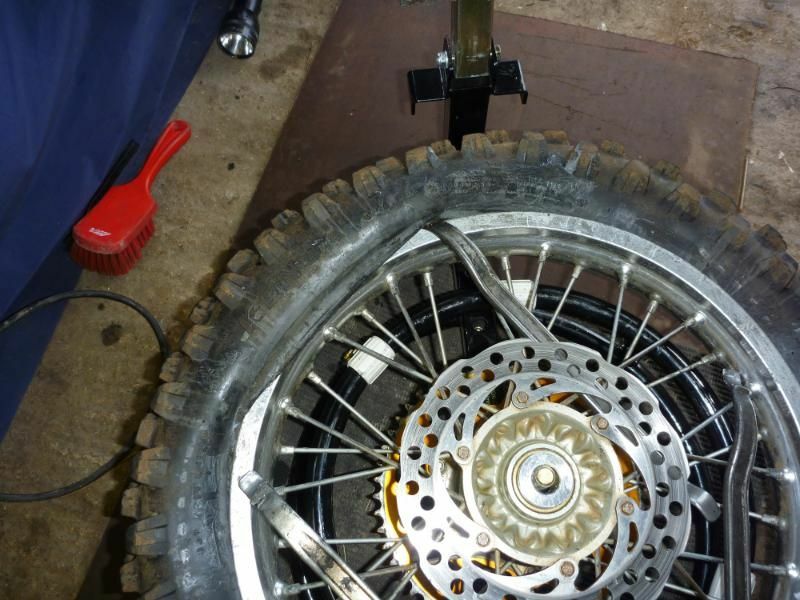 Once you've got it this far it’ll go on ok. As you can see I was paying too much attention to the direction of the tyre and getting the orientation of the wheel correct to notice I’d made a mistake to start from the sprocket side! 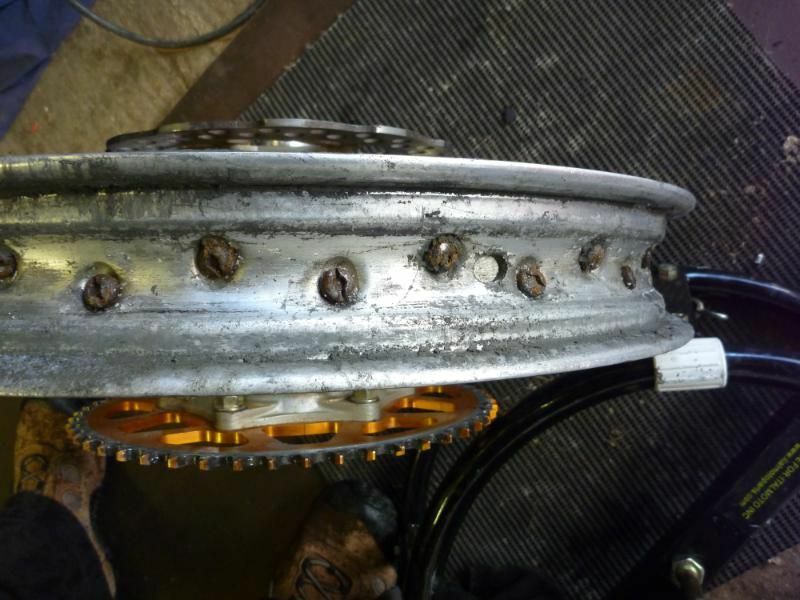 Not only does this get in the way, as it’s bigger than the brake disc, but you can do without having a saw tooth object close to your hands when levering tyre levers. Doh! 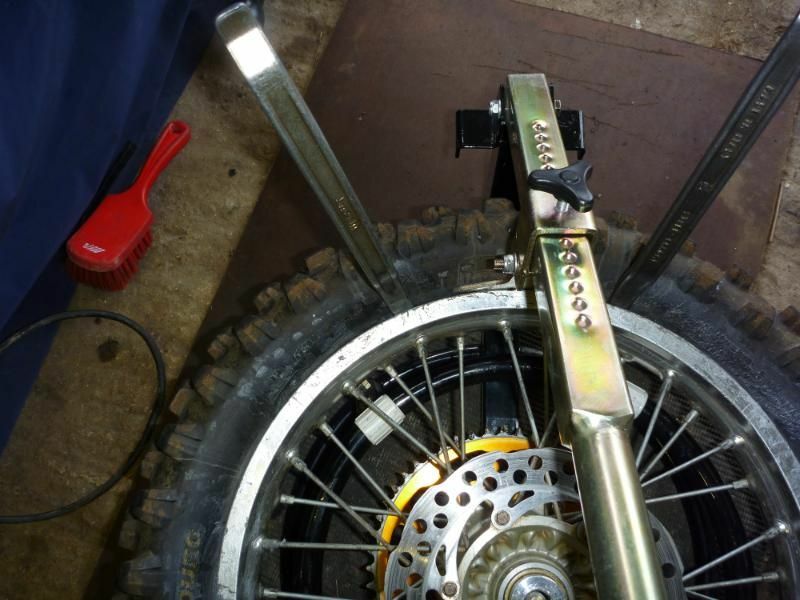 Now you can start to lever the second bead over the rim - and then take it off again as you suddenly realise you’ve not lubbed the tyre! 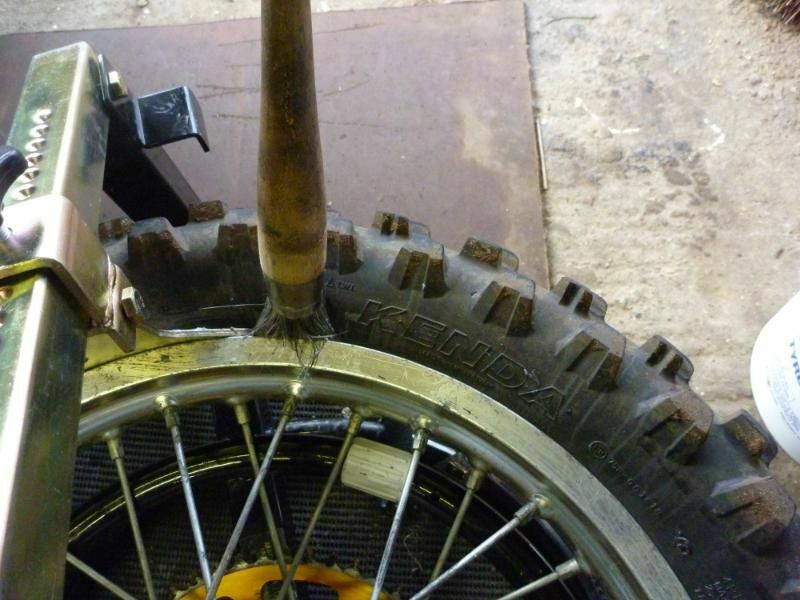 Once you’ve got it started fit a ‘bead buddy’ to keep the tyre in place (it stops the tyre climbing back out the rim). 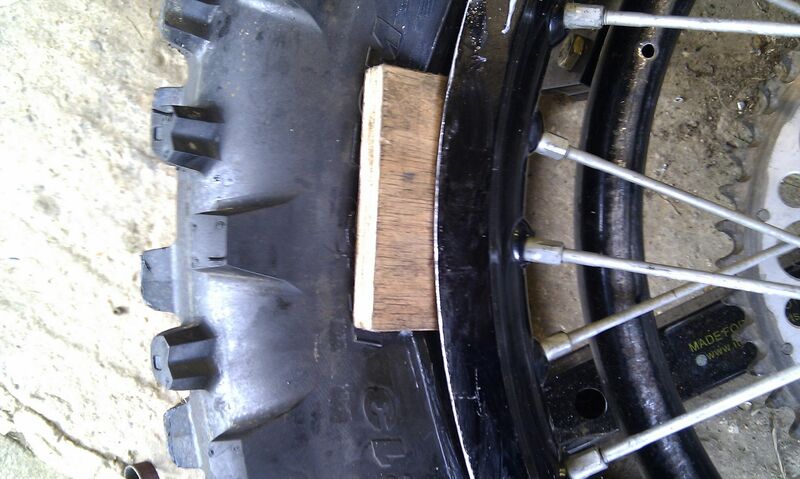 Once ¾ of the tyre is on I use a clamp of some sort to push the tyre down into the rim. 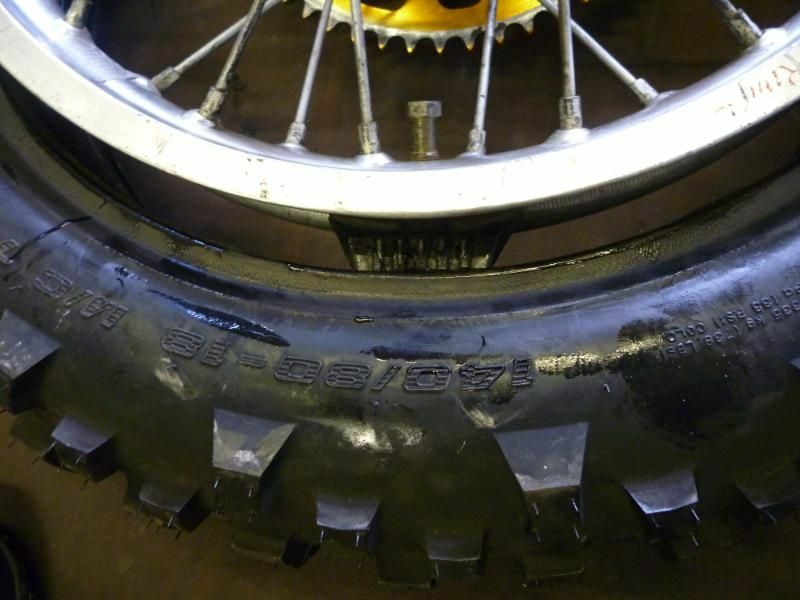 Pushing the tyre down into the rim gives you more slack over the opposite side of the tyre and this allows you to get the tyre over the rim without braking it. My ‘quick clamps’ seemed to have made a quick get away somewhere so I grabbed the g-clamp off the wall and used that. 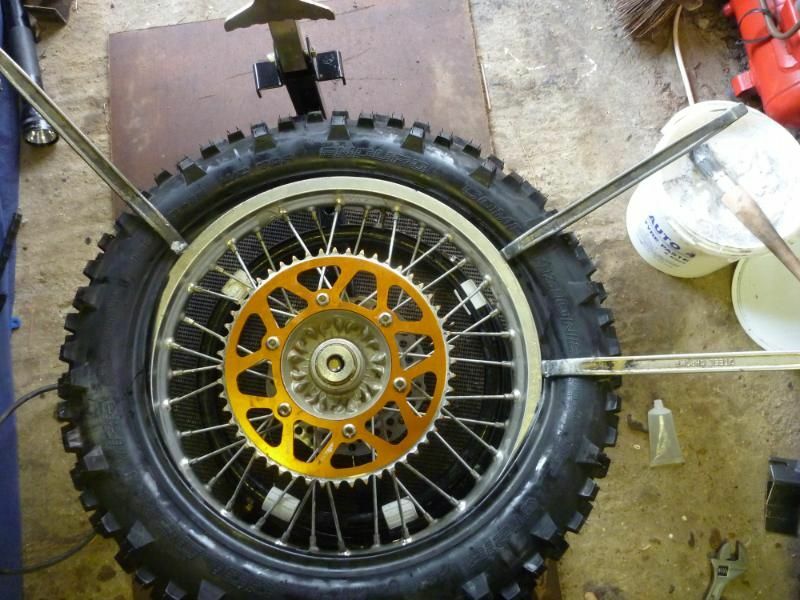 So with the clamp in place and using the bead breaker as well I keep the tyre down in the rim while I use the lever to slip the tyre over the rim. 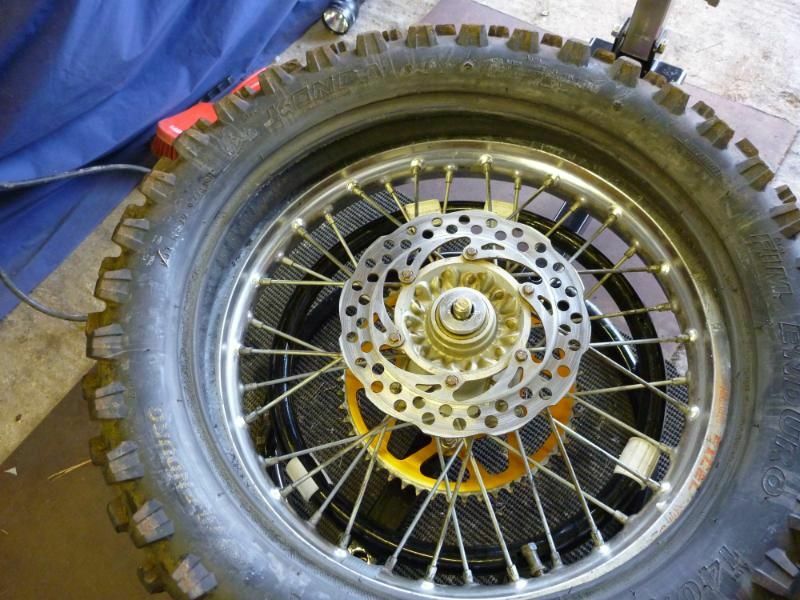 With the tyre lubbed and pushed into the rim it’s a piece of cake. I stopped to take this photo and need to keep a foot on the lever to stop it pinging away. and I use the bead break to shove the last little bit over the rim. I use the breaker to push the tyre off the bead buddy to get it free. 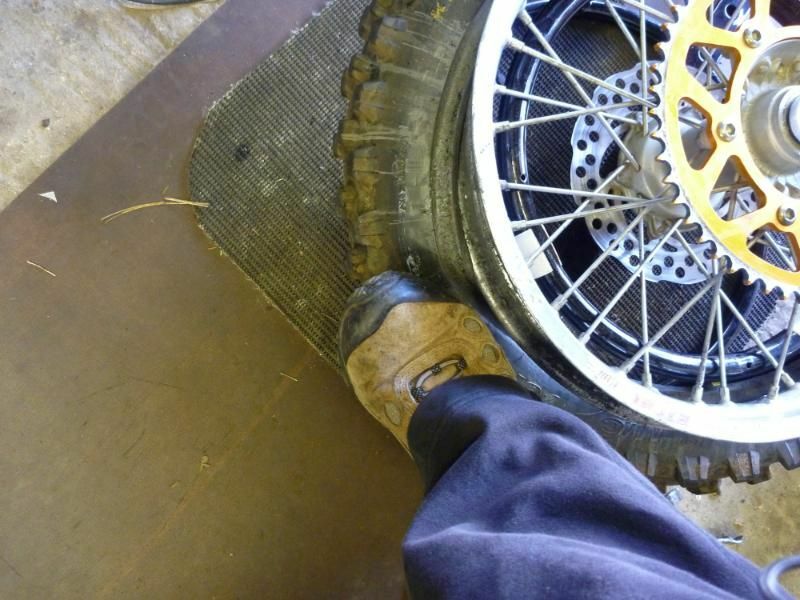 Edit: Since doing this guide i have fitted 'tubless' car type valves to help pop out the tyres on the rim. Ask for the smallest size they do..... you'll still have to drill out the rim somewhat to get them to fit but it's worth the effort. The tubeless valve seals the air inside a lot better than an old tube valve. 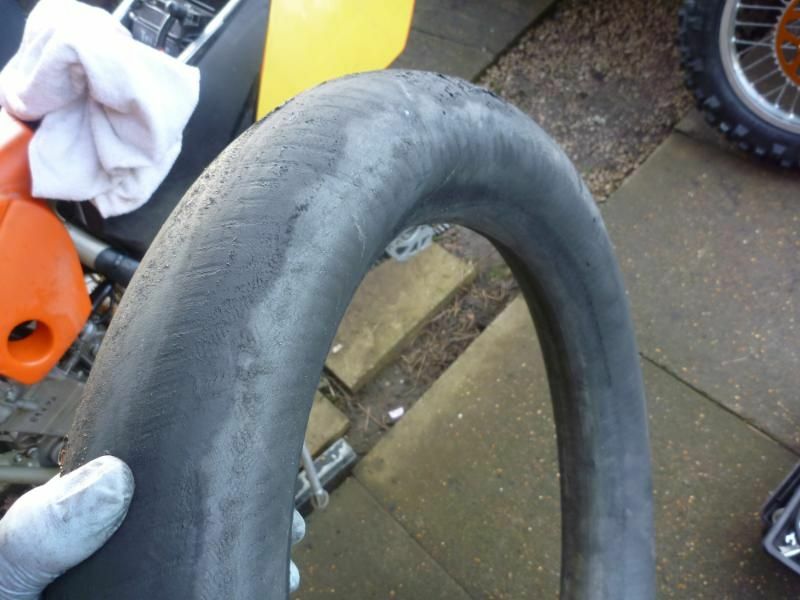 remember to seal the rimlock with a bit of old tube rubber and the tyre will inflate and pop out onto the rim completely. A two year old mousse – not bad eh? Still loads of life left in that! This trick was shown to me by a friend. 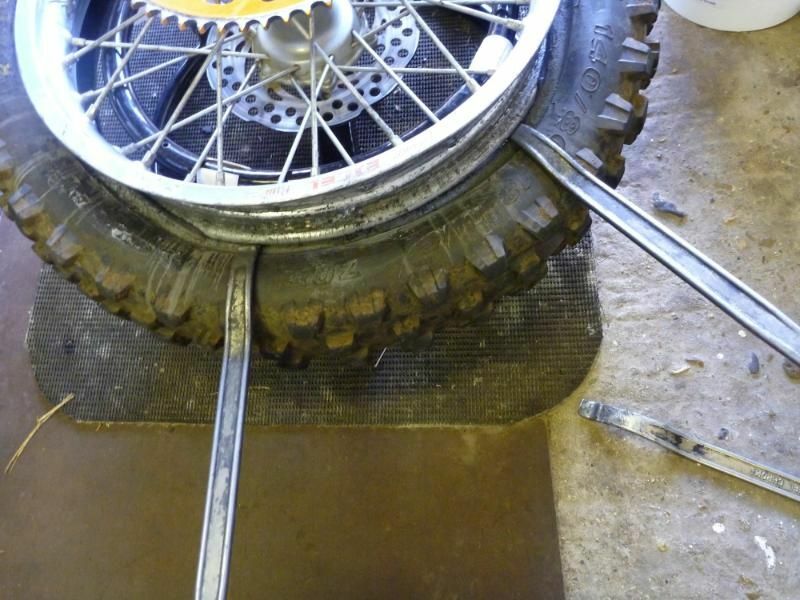 Cut some small little blocks of ply and use them to hold the tyre down into the rim. This works quite well on the rear but I've found it to be less successfull on the front. In time when you have done more and more changes you tend to get the hang of it and the clamps and/or bits of wood tend to not be used so much. If you don't clean the rims often enough you end up like this! If you enjoyed this report and would like to be notified of new reports or website updates then join the mailing list. To sign up to the list just click HERE and send me an email.